HOT are pleased to introduce our sixteenth Nethope Device Challenge grant to the YMCA in the Gambia. Initially, under the Nethope Device Grant, HOT planned to support twelve OpenStreetMap communities with mobile phones, laptops, connectivity and technical training. We have now expanded our reach to communities in Bangladesh, Botswana, the Gambia, Guinea, Indonesia, Kenya, Liberia, Mali, Mozambique, Peru, Sierra Leone, Tanzania, Turkey, Uganda and Zambia. The Gambia is a small coastal West African country, with around 2,000,000 inhabitants. 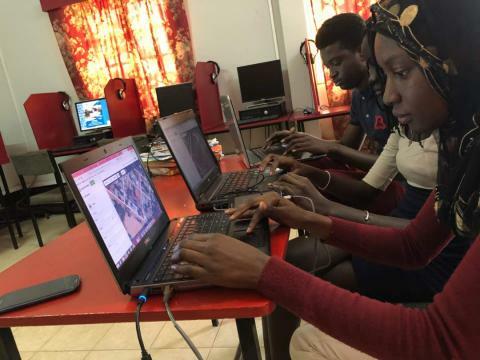 After 22 years of dictatorship, which imposed internet restrictions, the community in Gambia are embracing the global open data and mapping movement and contributing to OpenStreetMap. The main aim of the Nethope device grant will be to provide mobile phones and laptops to young people to conduct field mapping exercises. The focus will be on mapping social services such as hospitals, street names and water points, and better understanding key community assets. Heavy bi-annual rains and the flat topography of the country means that flooding is an ongoing risk for inhabitants. The maps produced by the Gambia OSM community will improve disaster relief response plans The grant will be managed in collaboration with YMCA Gambia and mapping modules will be integrated into their 2018 ICT summer camp which will help improve ICT literacy to over forty 10-17 year olds. Thank you to our donor Nethope for allowing us to continue to support the amazing work of OpenStreetMap communities across the globe.